And can also be placed inside the garments. Open the cellophane envelope well and remove the tablets needed to protect the garments and hermetically seal the packaging. 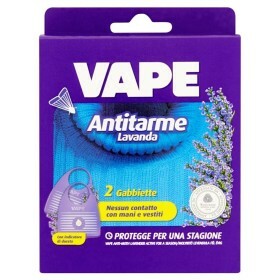 To avoid the evaporation of the active ingredient. Place the pads in the cabinets or drawers, taking care that a minimum air circulation around the pad is guaranteed. Two pads are enough to protect small cabinets. For larger cupboards, it is recommended to use 3 pads. In drawers, make sure that the pad is on top of the garment to ensure proper air circulation.